I had some blog posting prepared for that week, but, forgot to post. Oh, well, it looks like everyone out there in cyber land got lucky! I was going to try some new lighting techniques with my buddy Steve, but the weather got to us and we were not able to shoot, so instead, I just went out and roamed the countryside looking for something that might resemble a decent photo. What photographer does not like fog? It adds instant mystery and mood to any photo. Add some water and a few boats, and it is hard not to make a good photo. 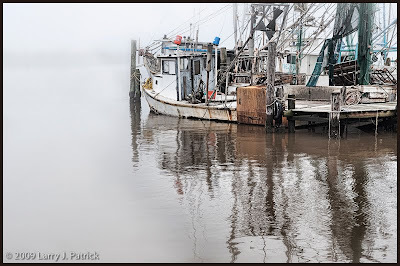 As I looked at this scene before me, I wanted emphasize the contrast between the details in the dock and boats and the total lack of details in the foggy foreground and background. I decided to frame the detailed portion of the photo in the upper right quadrant and leave the reaming portions of the photo as negative space to help emphasize the details. I tried various crops of negative space and finally settled on the photo as shot. A lot of people might think the amount of negative space is excessive, but I felt that I needed that much space to balance and contrast with the details of the dock and boats. Camera settings: Nikon D3, Nikon 28-70mm f/2.8 at 56mm shot at ISO 200, f/13 and 1/90th of a second. Photoshop—used nik Color Efex Pro tonal contrast to add highlight, mid-tones and shadows of the dock and boats and then sharpened that are using a high pass filter in the soft light mode. Great take on a mature subject. I really like the composition and you captured a lot of great detail in the shrimp boat and dock. You can almost smell the salty air looking at this shot. I don't like fog when I'm driving in it and can't see the front end of my truck, like New Years eve going to Baytown Nature Center at 4:30am. This I like. The negative space adds to the foggy feel, not taking away anything in this shot. There is just enough background shoreline to anchor the shot (no pun intended). Love the processing too. Interesting subject and composition Patrick! MIssed your postings. Being from the bayou country, I love this one. It reminds me of early morning back home. Great composition. The details in the boat are wonderful. Outstanding use of negative space to help deliver your vision. Very striking image. It almost has a painterly quality to it. I do think a little less white might make it stronger. Too much white. My eye is constantly pulled to the white. Quite different look at fishing boats. The contrast between the simple background and the boats makes you realize how complicated the boats are. Nice job. Good subject that you have photographed in a totally different and interesting way. Good job. Good use of negative space. It draws all your attention to your subject. Well done. A photo that I would return to and study. Larry, I love it. It is just as you said and composition of 1/3 vs 2/3 on boat is great! What brought my eye to the boats is the small amount of blue in bits and pieces in that area.